The Case for Right to Education of Choice: Key Findings from the Delhi Voucher Project - School Choice Campaign: Fund Students, Not Schools! 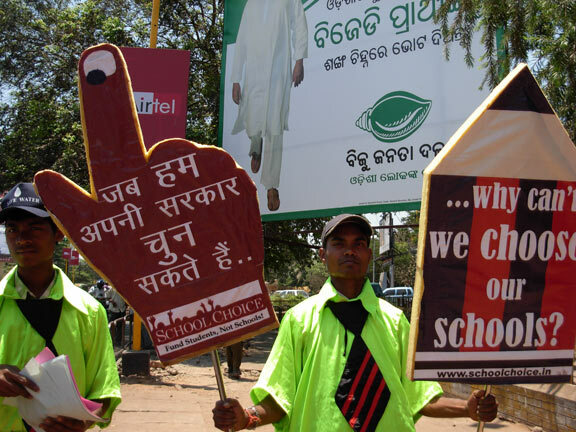 The School Choice Campaign conducted a paraller, issues-based campaign in the lead up to the 2009 Lok Sabha elections simultaneously in Jharkhand, Orissa, Rajasthan and Delhi, to create political awareness on the disparities in educational opportunities. Around 200 sitiing Members of Parliament from the aforementioned states were sent targeted information pertaining to the educational status of their constituency along with customized School Choice solutions to address specific problems. "If we can choose our governments...."
"....why can't we choose our schools?" 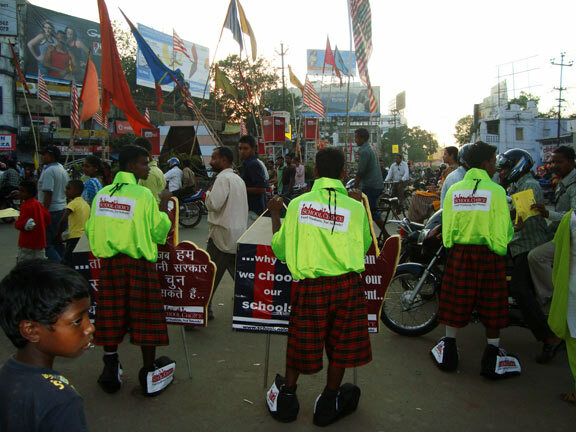 JHARKHAND: Jharkhand School Choice Alliance under the leadership of ASHA (Association for Social and Human Awareness) successfully conducted the campaign in Ranchi and Khunti districts from 8 to 21 April. RAJASTHAN: In Rajasthan, the campaign was conducted in Jaipur from 22 April to 5 May by our local partner, a street theatre group called "Ras Rang Manch'. ORISSA: In Orissa the campaign was conducted in the local dialect Oriya in Bhubaneshwar from 12 to 21 April. 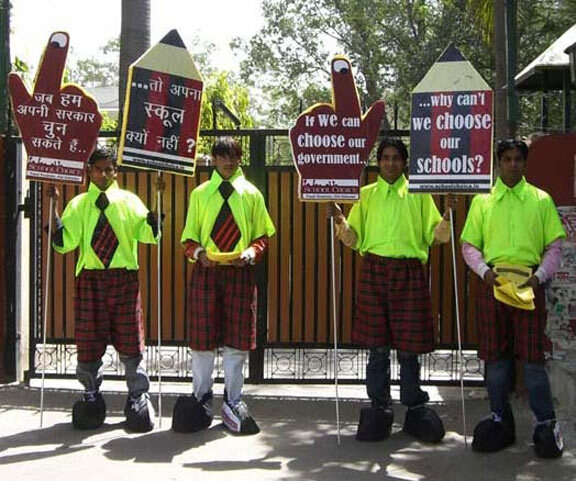 In the course of the campaign smaller political parties such as the Jaago Party and the Bharat Punanirman Dal voiced support for the School Choice Campaign. 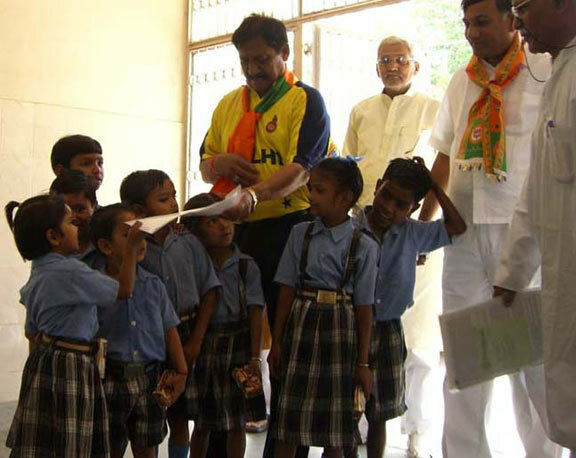 Among the national parties, BJP's East Delhi candidate Mr. Chetan Chauhan was very receptive and promised to work for education of choice for the underprivileged. "School Choice is a very good idea. The poor and underprivileged children should enjoy equal rights when it comes to choosing the best schools for themselves. I support this idea and initiative and no matter what the outcome of the elections, I will work towards getting quality education of choice for the underserved community," said Mr. Chauhan. The representative of Congress' New Delhi candidate Mr. Ajay Maken received the memorandum demanding school choice and expressed his support for the idea. The campaign received widespread media coverage in 14 leading national and regional dailies.